This is my initial entry for this blog. This is the place where I will be posting articles and thoughts and information about Congressman Duncan Hunter (CA-R) who is running for President in 2008. Duncan Hunter is a TRUE CONSERVATIVE and the only choice for conservatives across the nation. Duncan Hunter is RIGHT on the issues that matter. He is RIGHT on the War on Terror…We need to protect America from the threat of our enemies. He is RIGHT on Immigration…Build the Fence, it WORKS! He is RIGHT on the 2nd Amendment…There is one thing criminals prefer over any other and that is unarmed victims. I hope you enjoy this blog and feel free to post comments or email me if you would like to discuss the issues presented. This entry was posted on September 2, 2007 at 10:17 am	and is filed under elections, politics, presidential candidates. You can follow any responses to this entry through the RSS 2.0 feed. You can leave a response, or trackback from your own site. Nice blog you have started and for a good man as well. 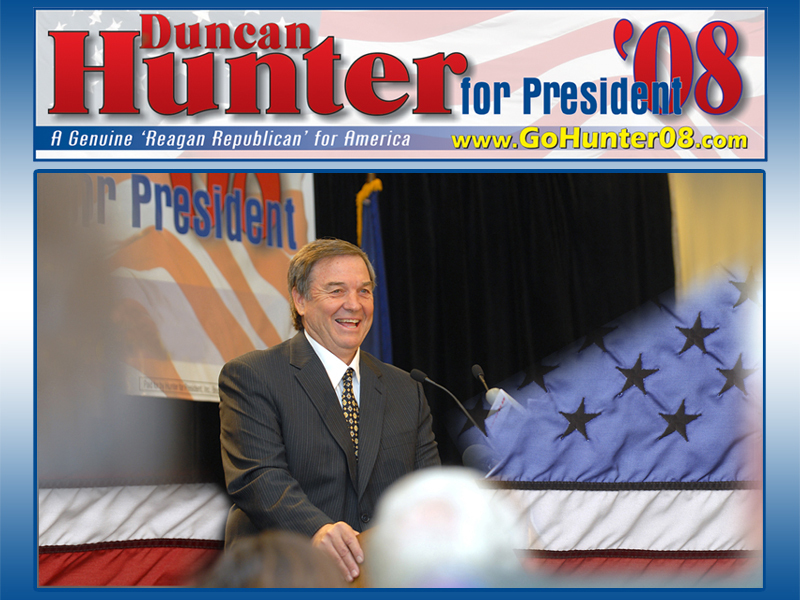 I have added a link to your blog under my Duncan Hunter Links at my own blog. I truly hope we can get Hunter noticed by more Right Hearted Americans and get him where he belongs, in the White House. Duncan Hunter can win if Americans focus on issues!